Image courtesy of the artists and jvictorsson.com. 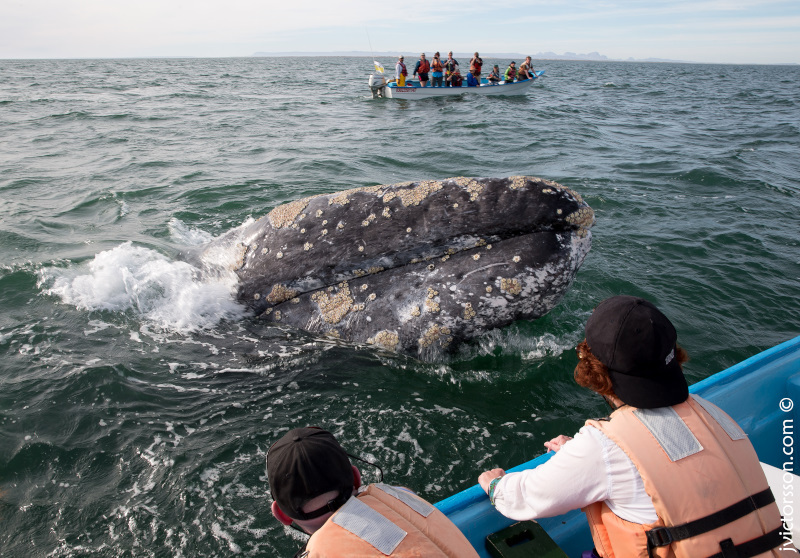 In February 2014, Laurel Braitman and I traveled to the San Ignacio Lagoon to spend a week with the ballenas amistosas, the friendly gray whales of Baja California. We were motivated by the desire for a shared experience with wildlife that would cross-pollinate our disciplines of history of science and art, respectively, and hopefully ignite a future collaboration between us as well. 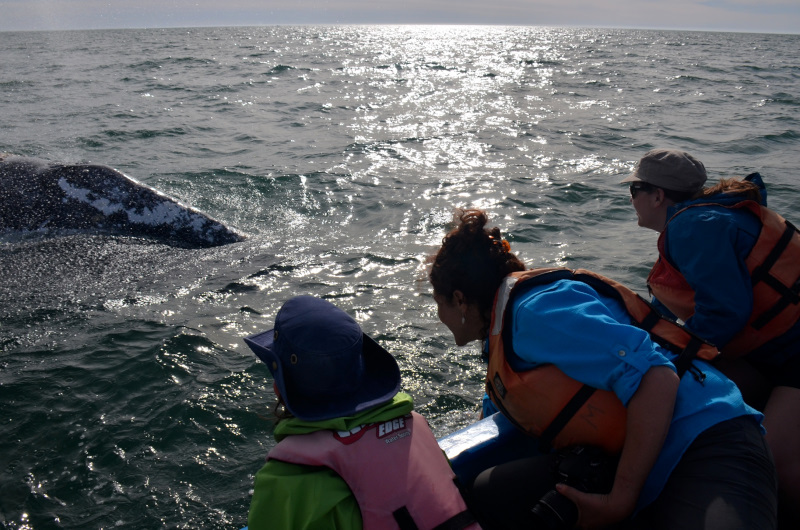 The best way to visit the whales are with a tour operator, and the one we picked, Baja Discovery, was superbly run. The boat drivers and guides are the whales’ colleagues and supporters, protectors and interpreters, fisherman from the area whose own knowledge and know-how added immeasurably to our experience. We had fantastic fellow travelers in the group too, including an Emeritus Professor of Geochemistry from MIT, a wildlife photographer from Puget Sound, and many serious amateur naturalists who enriched our experiences with the whales. We conducted interviews in a makeshift sound studio in our tent and asked questions: What do you think the whales will act like? Smell like? Sound like? Feel like? There were many thoughtful stories, some tears, and an impromptu skit of whale mating role play performed by a mother and son in our group. We also made sound recordings of the 250-plus whales that were in the lagoon that week. The sounds of the whales breathing are haunting and beautiful and travel very well over the water. 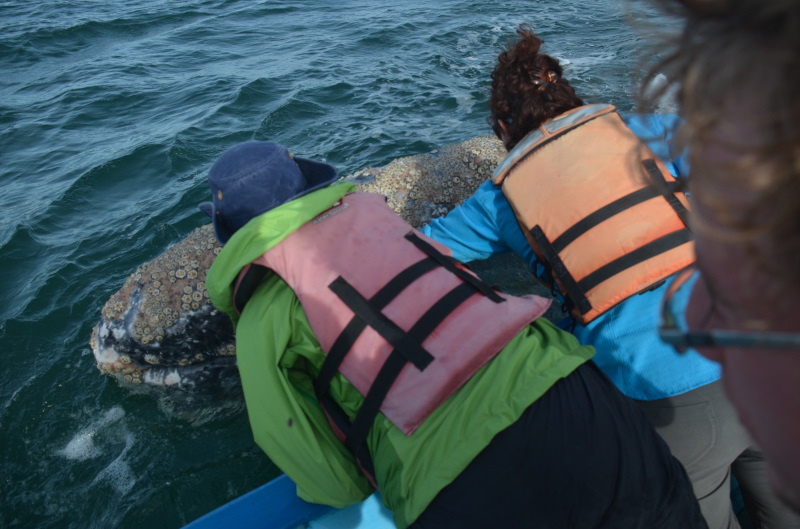 We photographed the whales too, but we were more interested in capturing indirect visual evidence of their presence. One example are the so-called “Landing Pads” that whales produce after diving: flat patches of water about 12 -15 feet in diameter that were an indication of their location, but also their size and heft. This is a bit like an aquatic footprint (or tailprint, in their case). During the week, we went out in the boats a total of eight times. Experiences included getting very close to several mother-calf pairs; witnessing a group of eight males chasing down a female they were eager to mate with (she took refuge near our boat at one point); and, in the last fifteen minutes of the last boat ride on the last day out, encountering a VERY friendly whale who approached our boat and spent about 15 minutes with us, allowing lots of contact with our hands and even our lips. Both of us have been lucky to experience a variety of wildlife encounters, all over the world, and interacting with the friendly whales of Baja—as they blew whale snot and warm air over us and our boat, came up under our hands to be touched, and used our boat as cover to escape from unwanted male attention—was one of the most surprising, provocative and thrilling experiences of our lives. There were many thoughtful stories, some tears, and an impromptu skit of whale mating role play performed by a mother and son in our group. In the past year and a half, we’ve had time to sit with our own experiences of the encounter, and to observe how we talk to others about what happened on the trip. We have our own video and audio recordings and photographs, and many people have produced documentation with tools much more sophisticated that ours, but the one experience that is uncapturable is the sense of touch. “What did the whale feel like?” we are often asked. Recently, Laurel wrote an email to me describing a trip to Cabo San Lucas, where she saw grey whales at a distance, and said “It was weird and mystical to see them offshore, knowing how they feel under your hands.” I sat on a plane a few hours after reading that email and put my hand into a paper bag with a poppy seed muffin purchased at the airport and realized that the muffin’s surface yielded to my touch in a way that reminded me of the whale. We talked about this over a long dinner together in San Francisco about a week later, and discussed at length the interesting problem of description. I have worked with “translation problems” in past projects of my own such as Pleased, Pleased, Pleased to Meet’cha, a sound piece inspired by the different systems humans have evolved for tricky problem of describing bird song. Laurel’s own work has been deeply engaged in the way animals communicate their anxiety and mental distress, how humans attempt to understand these signals and then struggle to use human language to describe the sensory experiences of other species. How could we describe the feel of the whale in terms of objects that have a completely surprising, often distant, and indirect relationship to the whale? 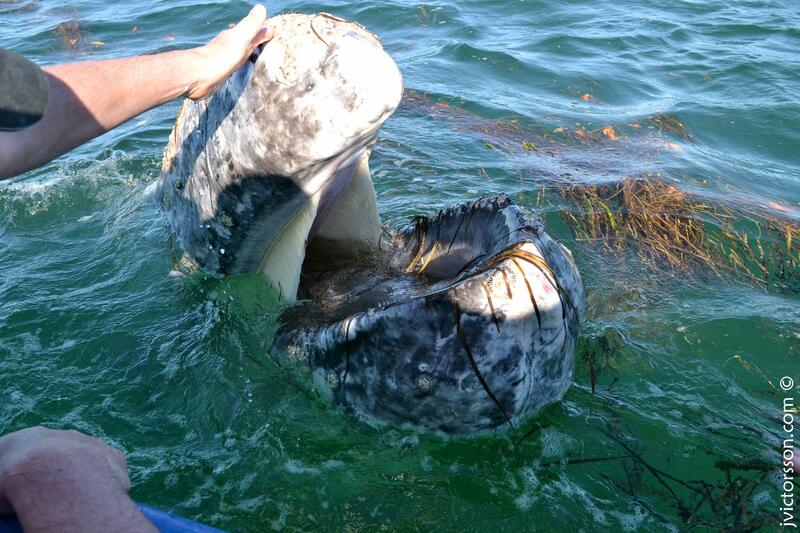 What else in the world feels like a cetacean? How can we use our tactile memory to communicate this experience to others? Perhaps our usual default description systems—the verbal and the visual—are inadequate when it comes to describing a whale. Through touch, could we surface an entirely different kind of understanding? Learn more about 2013 grant recipient Nina Katchadourian with Laurel Braitmen.